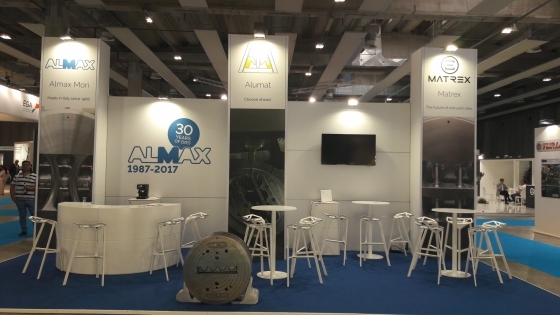 Alumat Almax Group has been exhibiting at Metef and presenting a speech at ICEB 2017 (International Extrusion Benchmark, this year along with Aluminium 2000 conference in Verona Fiere). Both events have met our expectations since we’ve had the chance to share news and updates with major players in our industry. This year we have showcased our die at ICEB: the die used for the benchmark was in fact ours. Our Eng. Tommaso Pinter has presented a speech about the comparison between the results we’ve obtained using the two major extrusion simulation software on the market: HyperXtrude and Qform. We’ve started testing and developing Hyperextrude in 2006 and Qform in 2017, after over 1000 simulations done with HyperXtrude in 2016. You can watch the full presentation (without animations) by clicking on the picture below. “the benchmark session represents the most reliable way to compare all the codes applicable to the simulation of the extrusion process in a single step and in the fairest and accurate conditions. Benchmark is organised with the specific intent of examining FEM codes capabilities and users’ knowledge in the simulation of an industrial case.”. Thanks to our presentation we’ve had the chance to get new contacts from Europe and abroad, and reinforce existing partnership with our clients. We can confirm that our choice to invest in Research and development is winning, with the strong intent to continuously improve the science of aluminium extrusion and maintain our leadership in this. We are optimistic and trustful 360°: extruders are eager to get new ideas and solutions in an increasingly demanding market. And we’re ready to take on any challenge. We love to be pushed ahead. If you’re an extruder, tell us what your dream solutions would be, so we can start working on them right now.